From Reefer Madness to The Man With The Golden Arm, Easy Rider to Drugstore Cowboy, Traffic to Trainspotting, Shapiro charts the ways in which cinema has both tried to shape the public mood and has been forced to respond to the realities of widespread drug use. 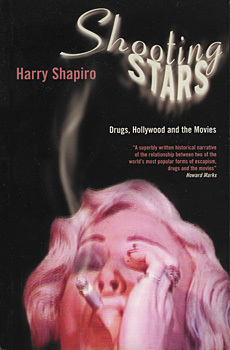 From 1920s marijuana mayhem through the cocaine storm that hit Hollywood in the '70s, and the heroin chic films of the '90s, Shooting Stars investigates the drug myths propagated in movies and maps the clear but complex links between censorship, public morals and the Hollywood dream machine. This is the inside story of an industry that not only wanted to have its coke and snort it but reserved the right to moralise about it afterwards. An invaluable and unique work of reference, Shooting Stars also offers a persuasive account of the ways in which the silver screen is both mirror and guide to our ever more drugged-up age. "Shooting Stars is a superbly written historical narrative of the relationship between two of the world's most popular forms of escapism, drugs and the movies, and their relevance to censorship, culture, glamour, and the rest. I found it fascinating, particularly when addressing the paucity of historical dramas about the Opium Wars; the phenomenon of movie-makers whose position in society allowed them to snort and smoke everything in sight while they sensationally created US Government-endorsed propaganda movies that portrayed drugs as most evil; and the final irony of the attempts to fulfill such agendas by luring youth from the clean and bright outdoors into dark and dingy cinemas where they could safely take drugs"